A few months back we ventured down to Hong Kong, this time with my Mama in toe, to spend 9 days in one of my favorite cities. The hubs took off ahead of us and the three shorties followed behind, leaving Tokyo for our Asia adventure. Traveling with a walking, talking toddler is quite a change from an infant. Thankfully Grandma and I tag-teamed the duties and the flight wasn’t terrible. A few spilled beers, mild tantrum and a dead I-pad were just minor hiccups in the 5 hour flight. For a then, 14 month old, the girl has become quite the seasoned flier. I’m sure she has more passport stamps than I did at 25. Trains, Planes and Automobiles. A cab ride to the train station, a one hour train ride to the airport, security, customs and incorrect name spelling on flight booking = a drink or 12. Our hotel was situated between enormous skyscrapers and the back hills of the jungle. It was beautiful and an example of the distinctive terrain and atmosphere in Hong Kong. My mom and I acted as tourists during the day, making it our mission to hit up as many “kid friendly” sites as possible. Victoria Peak was a must-see viewpoint on our list, but we kept pushing it off until the weather permitted a “perfect view”. We were quick to learn that a clear day in Hong Kong is celebrated and not as common as we desired. However, despite a semi-clouded outlook, the views were still incredible and the peak is full of restaurants, shopping and various photo taking opportunities that made it worth the scary trolley ride to the top. Don’t let that mug fool you, he is a scam artist that will chase after you if you take photos after he insists you take photos. Mom and I decided to walk down the Mountain. Don’t do it! The trail is longer than you think and it becomes a busy street NOT suitable for kids. Def pay the few extra dollars for the highest view point access. The panoramic skylines are breathtaking. Maya the Explorer is ready for her next adventure! Various friends told us to hit up Ocean Park and we are so happy we took that advice. I am not sure what to even call the “amusement park”, as it was a zoo, aquarium, theme park and Sea World all in one. The park was divided onto two sides of a mountain that overlooked the sea. The setting was beautiful and the park itself offered so much entertainment it would’ve been easy to spend more than one day there with kids. In order to get from one end of the park (bottom of mountain), to the other attractions (top of the mountain) you must take a cable car, or a shuttle. I have a fear of gondola rides, but we couldn’t leave the park without taking it. The views were amazing and you could see a panoramic look of the entire park. The pandas were easily the majority favorite. We were able to see them right when the park opened and avoided lines. It was just us and the bears. Right next to the panda exhibit was a goldfish aquarium. There were dozens and dozens of different “goldfish” varieties. I am not a huge advocate for the dolphin and whale shows, but multiple animal shows are included in the entrance fee. We were itching to get to a little port town called Aberdeen. We didn’t have a destination, but asked a nice gate worker at Ocean Park for a recommendation. 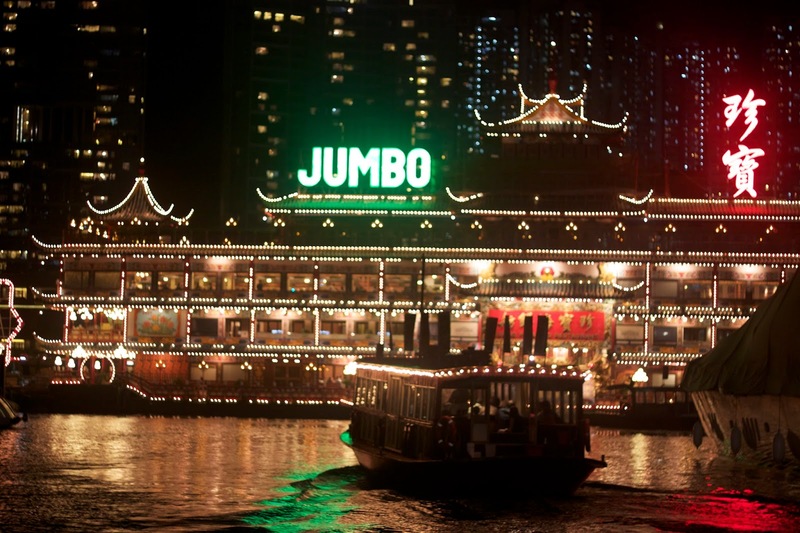 She told us to go to JUMBO restaurant. We didn’t know what to expect, but we were blown away when we hopped out of the cab. It was a floating Chinese restaurant. Boats were available every 10 minutes or so to taxi you back and forth from the docks. It was truly beautiful. Our good friend Amy booked us a table at an amazing, old school restaurant called The China Room. Inside the old Bank of China, the multi-floor restaurant was filled with avant-garde art, and apart from the main dining area, special themed rooms for private bookings. We had a great trip to Hong Kong and it is hard to cover all the amazing parks and sites just in one post. It was a jammed pack trip and so special to have my mom experience this incredible city with us and Maya.